Increase Buster Card performance by 15% while he's on the field. The courageous king of ancient Persia. From the fourth century BC. Known as the last king of Persia in the Achaemenid dynasty. Stood in the way of Macedonia's King of Conquerors, Iskandar, as his "rival" many times. 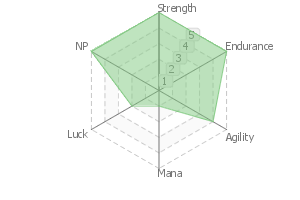 His strength lies not just in his combat skills, but in his wealth as well. 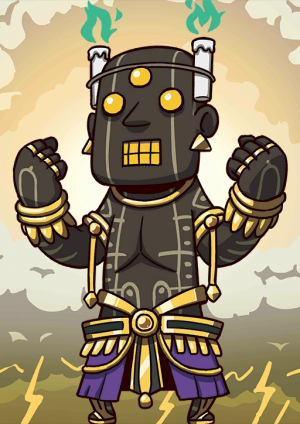 Strangely enough, he often replies quietly to his Master, which feels contrary to the severity of battle. He does not lose control of himself out of battle and listens closely to his Master. 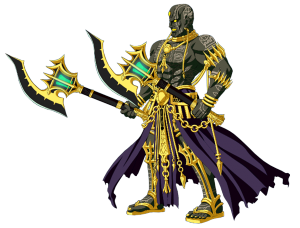 Skills like Disengage, which is effective for leaving battles, will not go to waste on him. Ten thousand soldiers that have turned into moving corpses or walking skeletons appear. They gather into the "War Elephant of Death" and annihilate the enemy. The immortal squad Athanatoi. The ten thousand elites that existed in history have become a Noble Phantasm. Their immortality and indestructibility have been emphasized in proportion to the legends that formed about them years later. 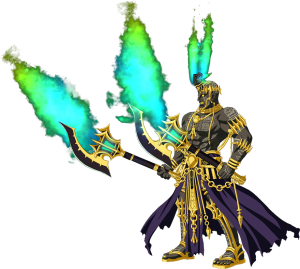 "War Elephant of Death" is a protectorate with immense magical energy will utterly destroy any enemy of the king. His wish for the Holy Grail is a "rematch with Iskander". The ideal rematch he wishes for is a clash between two great armies. Normally, he's a more obedient Servant, but he tends to go berserk when it comes to his wish, so be careful. A valorous king of Ancient Persia. A character from the 4th Century BC. Known as the last king of Achaemenid Dynasty. 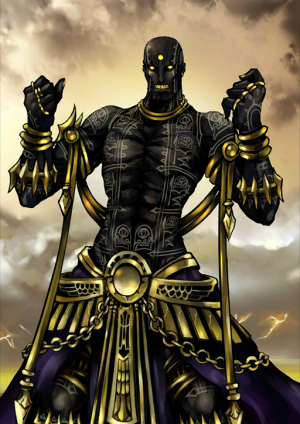 A 「worthy rival」 to Iskandar, the King of Conquerors of Macedonia, who had blocked his way multiple times. In contrary to the sternness of his fight, strangely his reactions towards his Master are mostly obedient. 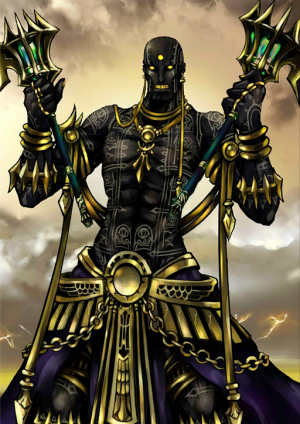 As he does not runs wildly in normal times, and comparatively listens properly to what he is told, his effective Disengage skill is also not wasted when retreating from battle. Ten thousand soldiers transformed into moving corpses and walking skeletons to appear, gather and become a 「war elephant of death」, exterminating the enemy. The immortals, Athanatoi. 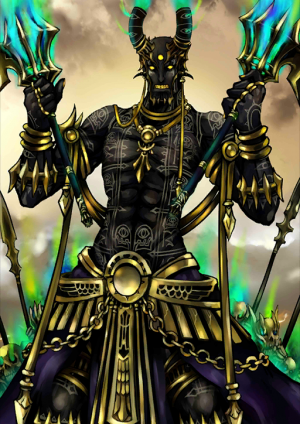 The ten thousand elite men that existed as a historical fact turned into a Noble Phantasm, their indestructible and immortal nature is being emphasized due to the legends established in future years. His wish for the Holy Grail is 「a rematch with Iskandar」. Not a one-on-one, he desires a rematch that is clash of troops against troops... Although a comparatively obedient Servant, he is likely to run wild when his wish is involved, so special attention is required. 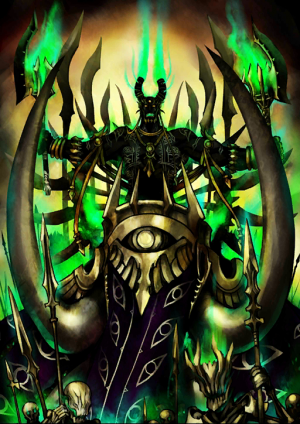 Darius III is one of the candidates for the player's first summoned servant. This page was last modified on 28 September 2018, at 03:06.